1449673759 -Microbes play a highly significant role in our daily lives as agents of infectious disease and are a major public health concern. 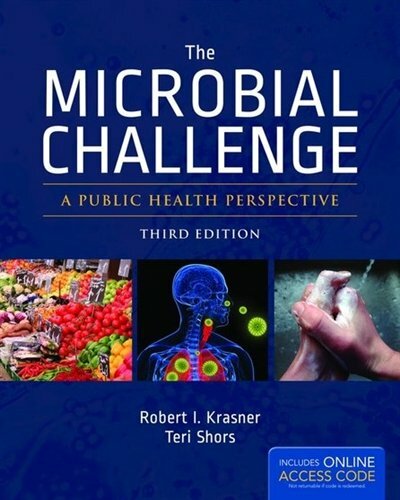 The third edition of The Microbial Challenge: A Public Health Perspective addresses this topic and has been extensively revised and updated with the latest data in a fast-paced field. It focuses on human-microbe interactions and considers bacterial, viral, prion, protozoan, fungal and helminthic (worm) diseases. A chapter on beneficial aspects of microbes makes it clear that not all microbes are disease producers and that microbes are necessary for the sustenance of life on Earth. The response of the immune system, concepts of epidemiology, and measures of control from the individual to the international level to thwart potentially life-threatening epidemics are described. Sections on fungi and fungal diseases are new. The third edition includes new and contemporary information on vaccinations, antibiotic resistant microbes, practical disinfection information, virotherapy and emerging diseases. New boxes throughout the text feature items of human interest such as big and bizarre viruses, probiotics, rats, and synthetic biology. Ancillary instructor and student resources have been updated and expanded including the end of the chapter Self Evaluations. -New end-of-chapter questions included in every chapter. -A wealth of new feature boxes add a real-world perspective to the topics at hand.